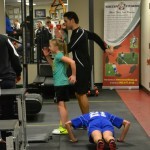 Strength and Conditioning Training represents one of the 5 components to the Soccer Fitness Training Framework. The ability to produce force. 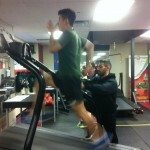 Our training makes muscles bigger, stronger, and more resilient to injury. All our sessions incorporate soccer-specific strength exercises during rest between high intensity treadmill running and plyometric bouts of exercise. The ability to move quickly. 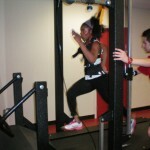 Our training will increase the speed of soccer-specific muscles and movements, including running and jumping, using unique and revolutionary science-based equipment including high speed running treadmills. The ability to produce high force, quickly. Our training improves power by challenging the muscles to overcome resistance at high speeds, including incline running treadmill sprints, box jumps, and hurdle jumps. The ability to sustain high intensity activity, and to recover between bouts of high intensity activity. Our training improves soccer-specific endurance through repeated bouts of high intensity activity, including treadmill sprints and plyometric exercises. The ability to move a muscle through its full range of motion. Our training improves flexibility through soccer-specific warm-up, mobility, and cool-down stretching exercises, which are a standard component of every training session.